Hay Cap presents their new season of hay covers that offer better protection for hay stacks with new features and options. 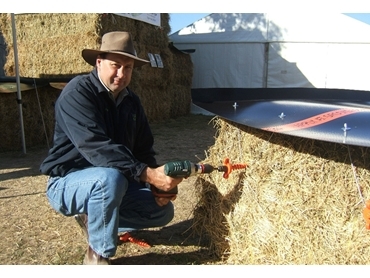 Phil Snowden, farmer and inventor of the Hay Cap hay covers, has announced this season’s product range will be 200mm longer and have the option of a new type of peg – the Hay Anchor. The Hay Anchors are new screw pegs that hold the Hay Cap hay covers in place. The Hay Anchors function by inserting them into the bale using either a rechargeable drill, speed wrench, or by hand. This helps make the tasks of covering large square stacks of hay quick and easy. Hay Cap’s hay caps are reusable hay covers that are simple to use by applying it at ground level in less than a minute. Hay Caps are manufactured from 3mm thick food grade recycled plastic, which offers its flexible and durable nature with a life span of 10 years. The hay caps are UV stable, vermin proof and simply stack on top of each other when not in use. Hay Caps can also be used after the stack is built, or with big bale stackers, without leaving the grounds. Hay Cap offers their 5 years of experience and expertise in manufacturing hay covers. For more information, visit their website.